Santa Monica Museum of Art presents the Mickalene Thomas: Origin of the Universe exhibition catalog. The comprehensive publication offers the first visual and scholarly evaluation of this highly acclaimed multimedia artist. Available now at GRACIE, SMMoA's shop, the catalog accompanies Thomas's first solo museum exhibition, Mickalene Thomas: Origin of the Universe on view at SMMoA from April 14 through August 19, 2012. The Origin of the Universe exhibition travels to the Brooklyn Museum in September 2012. The Mickalene Thomas: Origin of the Universe catalog features a wide array of full-color reproductions of Thomas's work, including portraits, photo collages, and provocative landscapes--many of which have never before been published. The catalog includes an introduction by SMMoA executive director Elsa Longhauser, a foreword by director of the Brooklyn Museum Arnold L. Lehman, a revealing interview with Thomas by Origin of the Universe curator Lisa Melandri, new critical essays by contemporary art scholars Sarah Lewis and Denise Murrell, and 26 vibrant color plates that showcase iconic works by the artist and the new suite of paintings created for Origin of the Universe. Together, the interview, images, and essays offer an insightful view of the historical and contemporary influences that inspire Thomas's work. Best known for her bold enamel, oil, and acrylic paintings adorned with rhinestones, whose subjects recall 1970s Blaxploitation film, Thomas's influences effortlessly extend from pop culture to modernist painting and beyond. In Melandri's penetrating interview, Thomas shares how her 1970s childhood, undergraduate experience at Pratt Institute, and growth as a graduate student at Yale University culminated in her recent body of work. In the catalog's "Mickalene Thomas on Beauty," Sarah Lewis, Professor at Yale University School of Art, contextualizes Thomas's work and the ways in which black beauty has been portrayed throughout history. For "The Anterior as Muse: Recent Paintings by Mickalene Thomas," scholar Denise Murrell, a 2011 PhD Dissertation Fellow at Reid Hall of Columbia University, Paris, presents an in-depth investigation of Thomas's nineteenth-century influences. Murrell examines how Thomas integrates such inspirations as Gustave Courbet, Édouard Manet, and Romare Bearden into her contemporary paintings of African American women, landscapes, and interiors. The 80-page, full-color catalog is the definitive Mickalene Thomas book to-date. It is bound in a distinctive fabric-hardcover that features an original Polaroid image taken by Thomas of an installation she constructed in her studio. 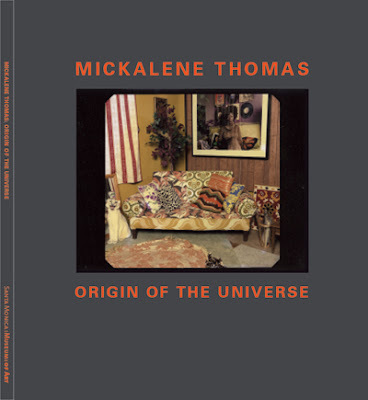 Mickalene Thomas: Origin of the Universe is published by the Santa Monica Museum of Art and distributed by SMMoA and Distributed Art Publishers (D.A.P.). The catalog is available now in GRACIE, SMMoA's shop, for only $39.95. Mickalene Thomas was born in 1971 and lives and works in New York. She earned a Bachelor's of Fine Arts degree from Pratt Institute and a Master's of Fine Arts from Yale University. Thomas has participated in residency programs at the Versailles Foundation Munn Artists Program, Giverny, France, and the Studio Museum in Harlem, New York. Her work has been shown in group exhibitions at the Museum of Contemporary Art Detroit, The Renaissance Society, Chicago, and MoMA PS1, New York, and is included in the important collections of the Museum of Modern Art, New York; the Solomon R. Guggenheim Museum, New York; the National Portrait Gallery, Smithsonian Institution, Washington, D.C.; the Whitney Museum of American Art, New York; the Art Institute of Chicago; The Museum of Fine Arts Boston; and the San Francisco Museum of Modern Art. Some content in the exhibition and catalog may be deemed inappropriate for younger viewers. Generous support for this exhibition has been provided by The Andy Warhol Foundation for the Visual Arts; National Endowment for the Arts; Lehmann Maupin Gallery, New York; Susanne Vielmetter Los Angeles Projects; and the Frederick R. Weisman Art Foundation. Additional support has been provided by the Los Angeles County Board of Supervisors through the Los Angeles County Arts Commission; Janine and Lyndon Barrois; and Cliff and Mandy Einstein. Through its exhibitions, education, and outreach programs, SMMoA fosters diversity, innovation, and discovery in contemporary art-local, national, and international. The Museum celebrates: expanding boundaries; exploring individual differences; enhancing public knowledge of art; and broadening the art experience. SMMoA is a collection of ideas. GRACIE is SMMoA's museum store. A multifunctional shop/storage/installation conceived by artist and architect Allan Wexler, GRACIE offers an inspired selection of books and merchandise that reflects the Museum's unique mission. GRACIE is named in honor of Board Member and former President Laura Donnelley (aka Gracie), a visionary patron of the arts and SMMoA muse. SMMoA is located at Bergamot Station, Building G1, 2525 Michigan Avenue, Santa Monica, California. The Museum is open Tuesday through Saturday from 11 am to 6 pm, closed Sundays, Mondays, and all legal holidays. Suggested donation: $5; $3 for seniors and students. For further information about exhibitions and programs, please call 310 586-6488.